Today, you are a member of... The Grapple - You Are A Member! 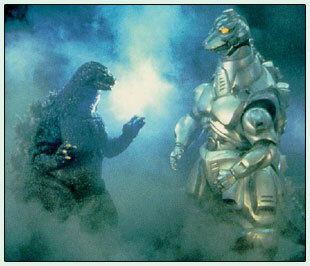 In the Mechanical Age, Mechagodzilla’s iron-clad exterior is the no-brainer armature of choice. But what about the Digital Age? Is there anything digits need more when facing foes than the flexibility of Godzilla’s fine rubber suit? Get ready for the grapple that’s coming on this week between your inner laser-eyed, space alien and your roaring, atomic-mouthed, gorilla-whale. Both want to be your psychic alpha-dog self, but as members know, hot rods only have one driving wheel. Best bet for appointing your reigning me marshal is to divine what, exactly, you need more of: Bionics or Phonics? Cosmic Forcefields or Strategic Amphibiousness? Metal Exoskeleton or Action Pants?